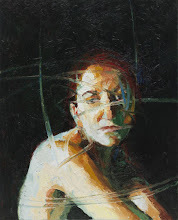 I studied painting at Northern Illinois University in the late 1980s. 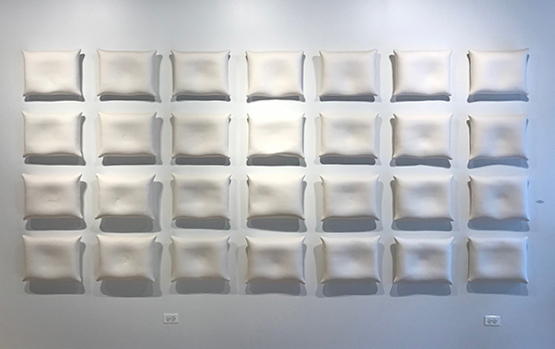 As a graduate student, preparing to transition into the art world, I spent many Saturday afternoons exploring the River North Gallery district. I was intrigued by the variety of work being presented. It seemed as if there were hundreds of galleries, showing every kind of work imaginable. I believe that I was first introduced to the beautifully-obsessive watercolor paintings of Robert Lostutter at the Dart Gallery. At that time, Lostutter was creating portraits of stylized men with beautiful feathers emerging from their faces. The figures—sometime singular and sometimes paired—were tightly painted in rich jewel tones. It's my understanding that Lostutter worked with a minuscule brush to obsessively apply the nearly dry pigment to the surface of the paper. The images that he produced were a combination of colorful pageantry and the concealment of identity. I was both captivated and intrigued by his notion of the permanent mask. I continued to follow Lostutter’s career and in 2012, Corbett vs. Dempsey presented Garden of Opiates. 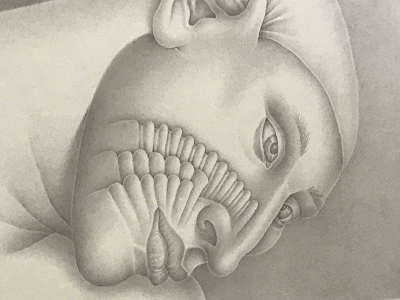 The exhibition offered both watercolor and graphite pieces that fixated on the floral aspect of the hybrid creatures. In this body of work, orchid petals replaced feathers. Petals are found growing from face—and regularly from the lower lip. The unique imagery was strangely beautiful, and I found myself eager to see what would come next… Which brings me to today. I stopped by Corbett vs. Dempsey to experience the latest exhibition of work by Robert Lostutter. Seeming to be a continuation of the Garden of Opiates, the Kyosei exhibition is a series of beautifully-rendered graphite drawings. 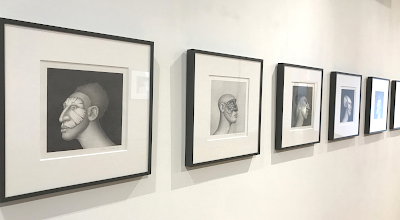 As I entered the third-floor gallery, I was welcomed by an army of freakishly beautiful creatures—some preoccupied with their own thoughts and others staring back, passively disinterested. Powerfully confident, the array of extraordinary creatures, seemed to hold a common secret. Like visiting the lion house at the zoo—where the creatures endure a life behind bars—these beasts are bound only by their frames. 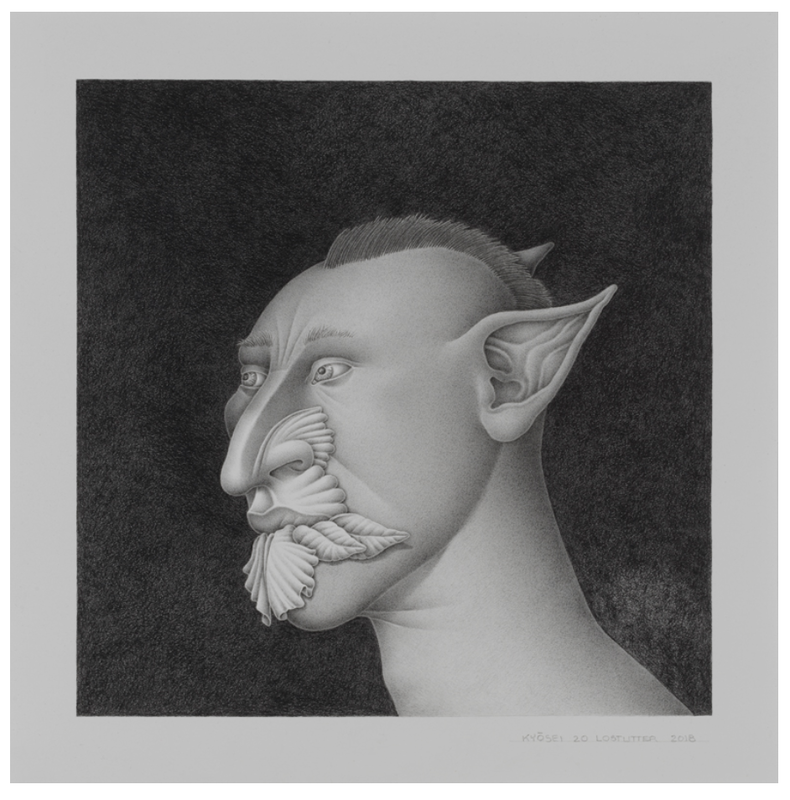 Lostutter begins a conversation that will conclude only in the viewer’s mind—questioning what these creatures might be thinking as they glare back at us. I found myself walking back-and-forth along the long wall of contemporary masterpieces—reminiscent of an animal pacing in a cage. I lingered between images—carefully studying the brilliance of Lostutter’s obsessive technique. This exhibition is a brilliant next step in the career of a contemporary master. Robert Lostutter: Kyosei continues through December 19, 2018. Corbett vs. Dempsey is located on the third floor of 1120 North Ashland Avenue, in Chicago. Gallery hours are Tuesday through Saturday, 10 am to 5 pm, and by appointment. The gallery will be moving in the near future—making the Lostutter exhibition the last within this amazing space. I think it may just be a personality trait… wanting to create perfection. I remember striving to create that flawless print piece, the perfect composition, the ideal image. It seemed impossible… in my own mind. There was always something that could be better. The idea of creating something—anything—that is flawless, seems flawed. But it’s not. It’s all about perception. Last week, I stopped by the Hofheimer Gallery to experience “Earth Bound”—a group exhibition that includes work by Amanda Gentry, David Criner and Denise Bellezzo. The exhibition offers an array of unique visual voices that come together in a peacefully inviting environment. 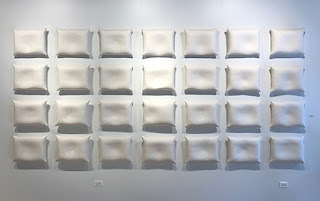 I was greeted by a wall of—what seemed to be—white bed pillows floating in a grid formation... work by Amanda Gentry. Upon closer inspection, the pillows appeared to be subtly marked with ghostly impressions of artifacts—quiet remnants of a hidden past. 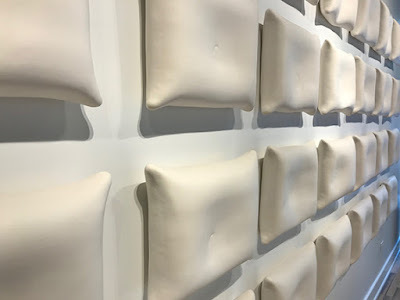 And then it became evident that the soft floating pillows were actually earthenware. Each piece, the clay impression of a soul at rest. Each, the unique fingerprint of a moment in time. Together, the impression of a segment of society. The works became an archeological find, perhaps asking the question; What will we leave to those who survive us? Will they notice? Will they remember? Brother John, Unglazed White Talc Earthenware Incised with Mason-stained Slip, 17"x14"x5"
Gentry also has some smaller pieces in the exhibition that reference unique artifacts. 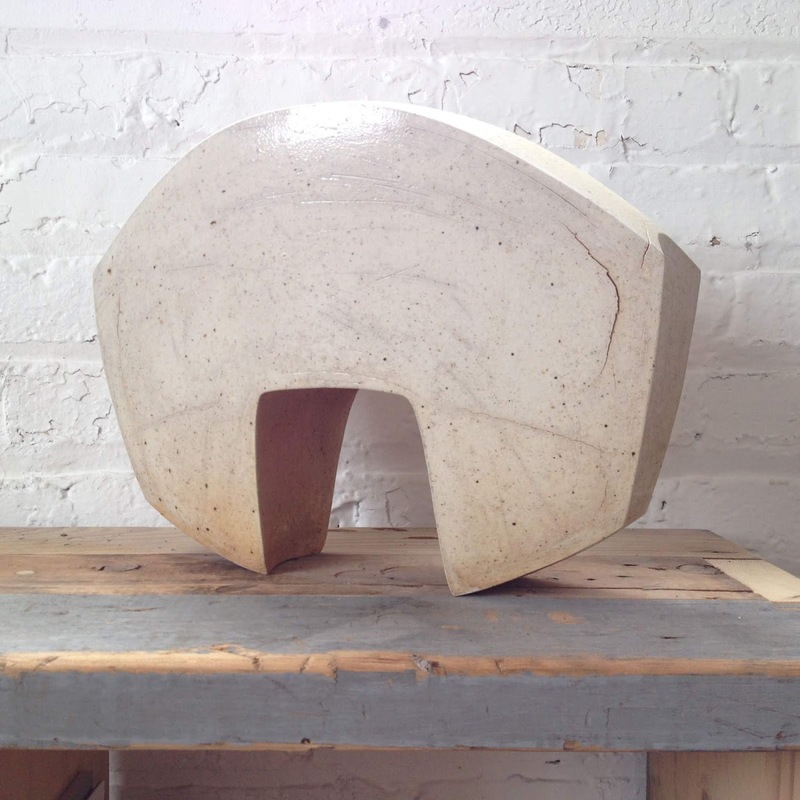 There are groupings of these smooth geometric forms, placed throughout the gallery—all pierced or indented with circular dimples that invite interaction. 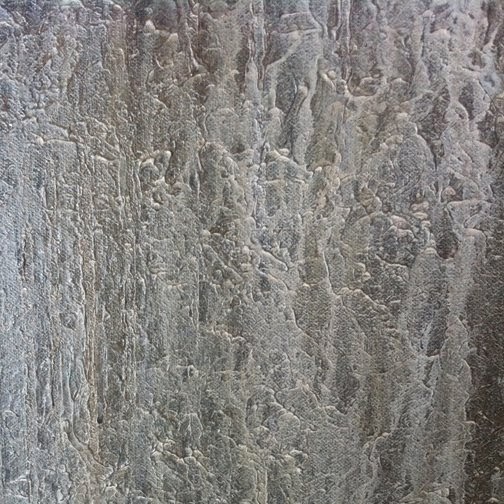 Each surface is smooth but reveals subtle imperfections. 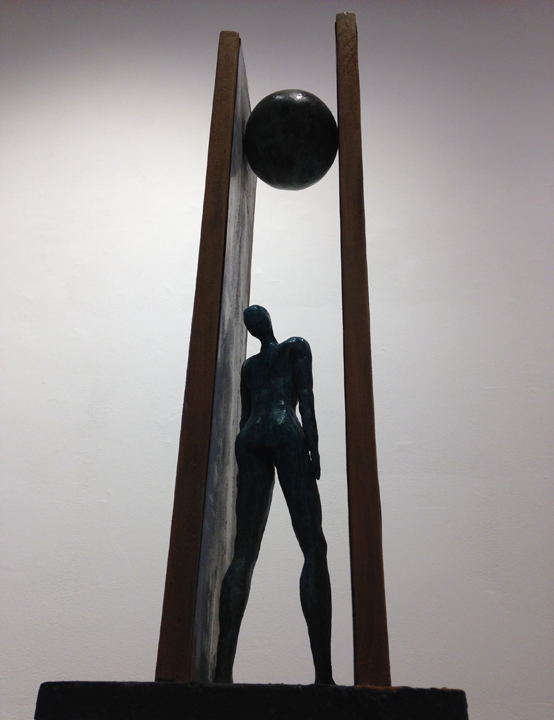 “This piece (above) signifies some breakthroughs for me as an artist. This is the first piece that was not what I set out to make. I generally have a tight sketch or idea that I intend to realize. This piece originally was going to be oriented the other way (what is bottom was to be top). It was going to have a rocking, convex bottom with the two extensions coming to points twice the length they currently are. 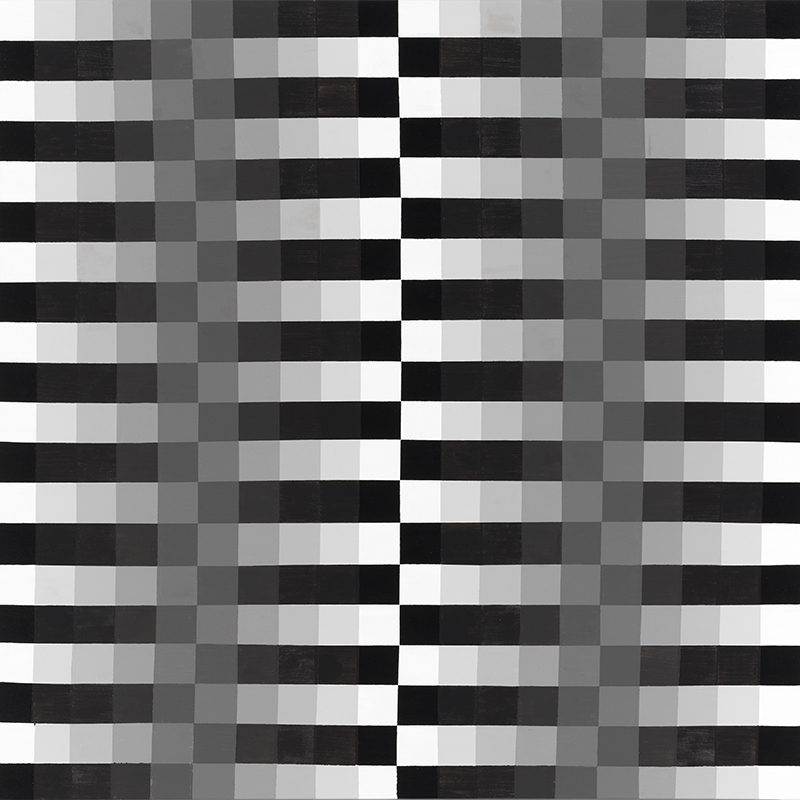 I realized as I was making this that I would need to rotate it and refine the bottom (now top) as I would not be able to do so once the two points were put on it. Upon rotating it and looking at it upside down I realized that it was perfect—that it needed to have the orientation it now has. 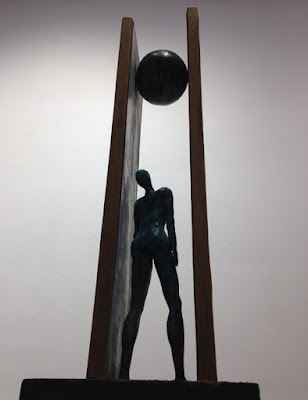 It was the first time I had looked at a work from a different perspective and allowed myself to change my plans. It was the first time I truly listened to the work. I had high hopes for this piece when I put it in the kiln. When it came out with cracks I felt defeated. I brought it back to my studio and tucked it away in my shelves. I was certain I would take a hammer to it in six months’ time. A few months passed, and an artist rep came for a studio visit. I had pulled all of my "good" work out onto the tables for her to see. 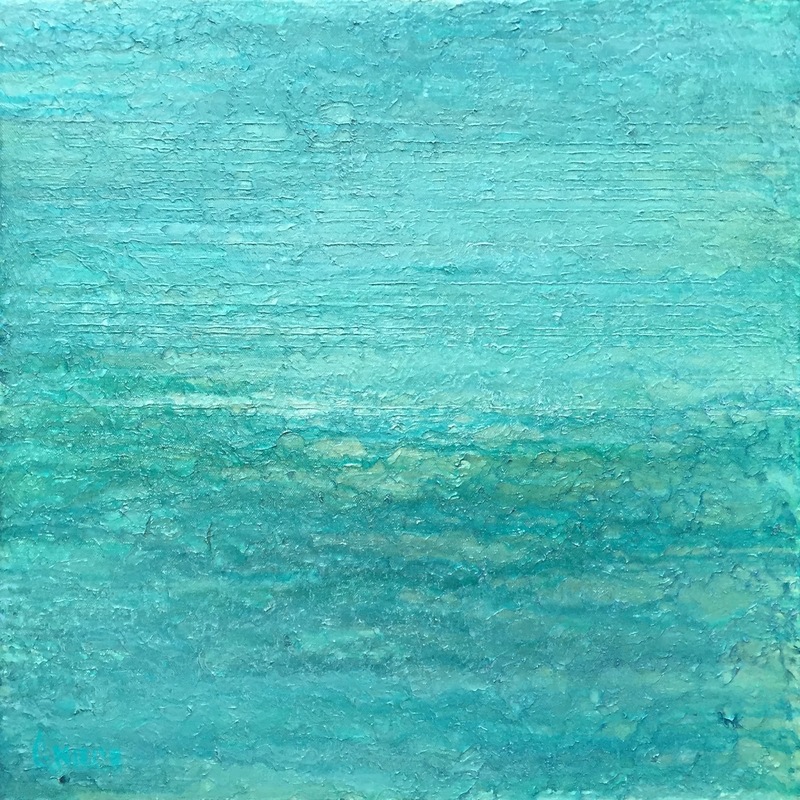 Amanda Gentry in “Earth Bound” continues at the Hofheimer Gallery through August 29th. 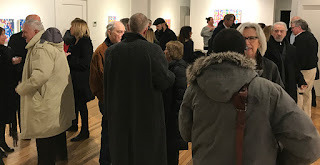 Hofheimer Gallery is located at 4823 N. Damen, Chicago, IL. 60625—on the north side of Chicago in the Ravenswood area at Damen and Lawrence. The gallery is dedicated to introducing contemporary fine art in painting, drawing and sculpture from established and emerging artists. Through the year the gallery will feature provocative, engaging, solo and group exhibitions. Julie Karabenick, 22.2013, Acrylic on Wood 29x29"
Color, tone and structure set the stage for the “Spatial Ambiguity” exhibition opening tomorrow at the Hofheimer Gallery. 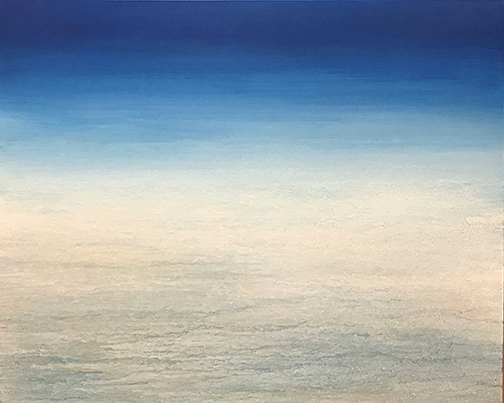 Hofheimer presents a two-person show highlighting a series of hard-edged precision-driven paintings by Marcia Fraerman and Julie Karabenick. The imagery includes a combination of gradient grids from Fraerman and optically pristine and uniquely dimensional structures by Karabenick. The show comes together with colorful pallets that invite the viewer into approachably-scaled formates. Spatial Ambiguity will open tomorrow—July 6th from 5-8pm. 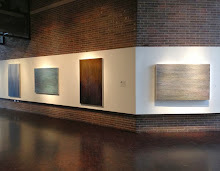 The Hofheimer Gallery is located at 4823 N. Damen, Chicago, IL. 60625—on the north side of Chicago in the Ravenswood area at Damen and Lawrence. The gallery is dedicated to introducing contemporary fine art in painting, drawing and sculpture from established and emerging artists. Through the year the gallery will feature provocative, engaging, solo and group exhibitions. Marcia Fraerman, Square One I, Acrylic on Canvas 20x20"
Charles Gniech, Untitled, 2018, acrylic on canvas, 40 x 50"
Yesterday, I dropped off a series of recent paintings at the Hofheimer Gallery. 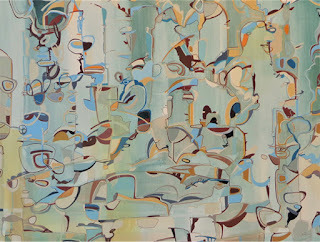 The paintings will be presented in the upcoming exhibition titled, "Perceptions". 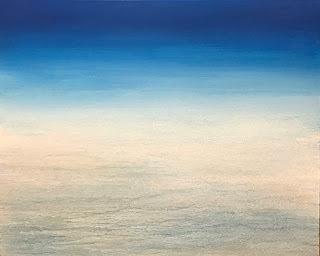 This group exhibition includes some of my most recent work—including an “Untitled” painting [shown above] utilizing a combination of my established multi-layered surface technique with a new element of smooth transitional color. The contrasts—tactile and hue—add a more dramatic spatial component to the imagery. This painting seems to be a evolutionary moment in the work that I've been producing over the past decade. I’m excited to be included in this exhibition. 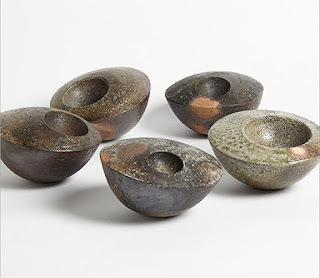 Although I’ve exhibited with Deanna Krueger and Rebecca Moy on numerous occasions, this will be my introduction to the work of Julia Katz. I have no doubt that “Perceptions” will be a beautiful array of surface, pattern and color with content that deserves both joyous and introspective engagement. 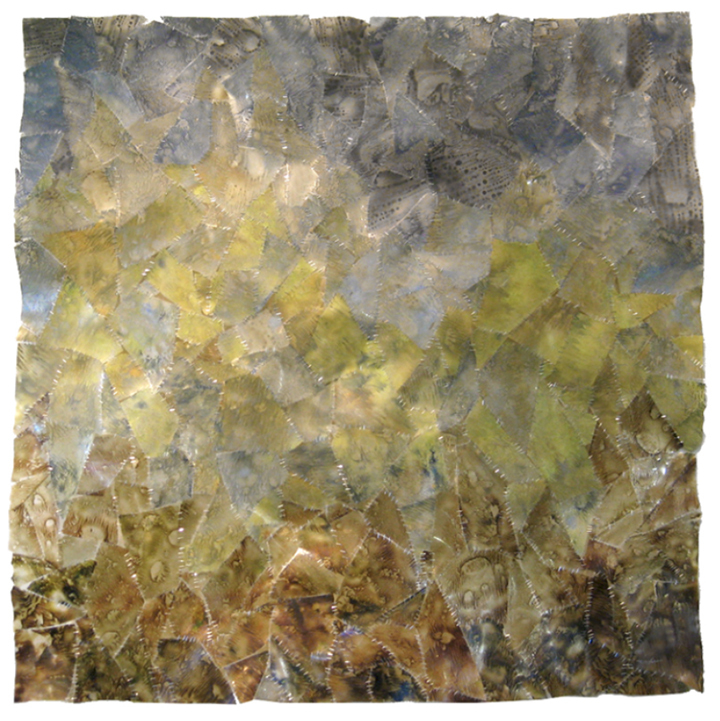 Please join me at the Opening Reception of “Perceptions” this Friday from 5-8pm at the Hofheimer Gallery. Hofheimer Gallery is located at 4823 N. Damen, Chicago, IL. 60625—on the north side of Chicago in the Ravenswood area at Damen and Lawrence. The gallery is dedicated to introducing contemporary fine art in painting, drawing and sculpture from established and emerging artists. Through the year the gallery will feature provocative, engaging, solo and group exhibitions. 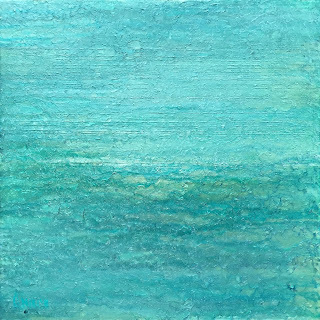 Charles Gniech, Aqua III, 2017, acrylic on canvas, 20" x 20"
In the middle of the country, surrounded by flat plains, towering skyscrapers and seemingly endless water, these artists explore abstraction in a vision of their own. 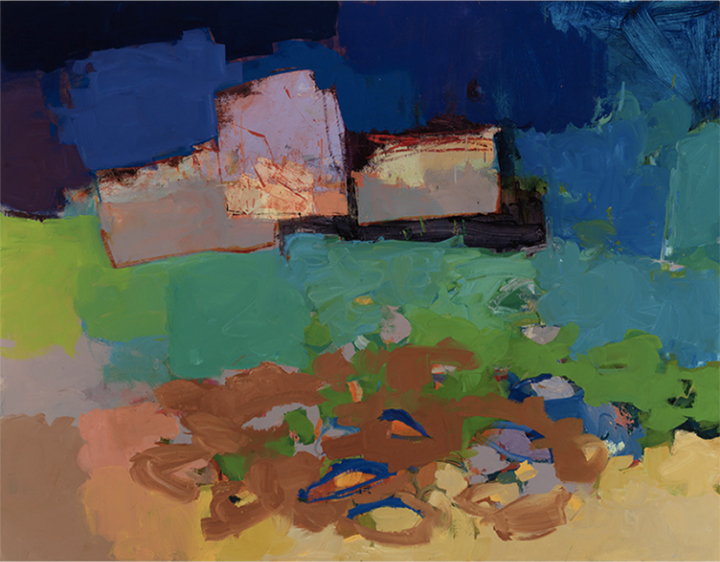 Their work references landscape, geology, and meditation, through color and texture. 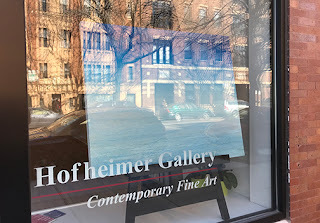 Hofheimer Gallery is located at 4823 N. Damen, Chicago, IL. 60625—on the north side of Chicago in the Ravenswood area at Damen and Lawrence. The gallery is dedicated to introducing contemporary fine art in painting, drawing and sculpture from established and emerging artists. Through the year the gallery will feature provocative, engaging, solo and group exhibitions. 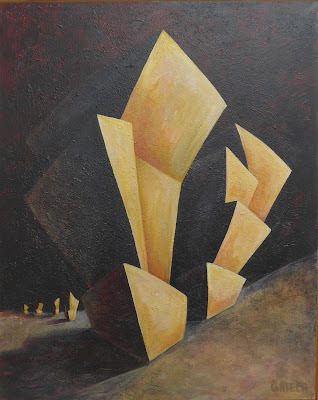 Charles Gniech "Inner Circle" 1996, acrylic on canvas, 48 x 60"
Purdue University - Northwest/NorthCentral in Westville, Indiana—has recently acquired a number of my large-scale paintings for their eclectic and edgy contemporary Fine Art Collection. Eight canvases were chosen from three bodies of work—spanning more than twenty years. Five of the selected pieces come from the “Sanctuary” series of 1996-97. There are more than four hundred stone circles found throughout Great Britain. The Sanctuary series was inspired by my time spent exploring some of these monuments. The prehistoric structures became a bit of an obsession during that period of my life. I would travel to the UK two or three times each year... spend a few days in London and then hop a train to—what seemed like—the middle of nowhere. Some of the sites were relatively easy to come upon while others were so far removed from civilization that I would find myself on top of a mountain or in a secluded meadow, only to be visited by an occasional herd of sheep. There was a feeling of peace and tranquility at many of these locations—something more than the power of the beautiful surroundings on which the structures were erected. The body of work titled "Sanctuary" was the result of these experiences. And the people that I met were life changing. 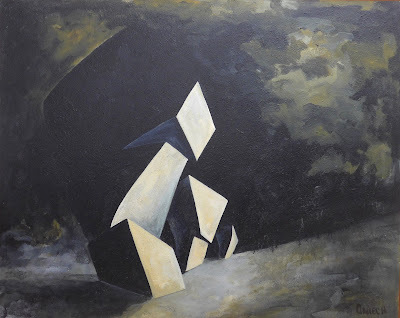 I define the paintings produced during the late 90s as “Structural Abstraction.” Although I would render realistic depictions of the structures on location, they were reinterpreted in my studio with exaggerated angles and dramatic lighting. The monuments were translated through planar analysis resulting in faceted structures of mass within dramatic landscapes. 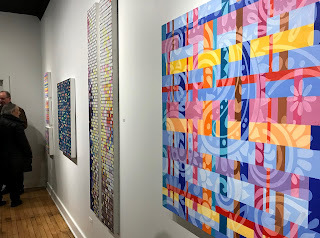 Charles Gniech "Geometric Sarsens" 1996, acrylic on canvas, 60 x 48"
Betty Cleeland "Arabique" 2015, Oil on Linen, 48" x 38"
An exhibition of brilliantly colorful paintings by Betty Cleeland opened Friday night at the Hofheimer Gallery, 4823 N. Damen in Chicago. When I arrived, I found myself greeted by a crowded, energy-filled gallery­—filled with patrons excited by the unique imagery being displayed. 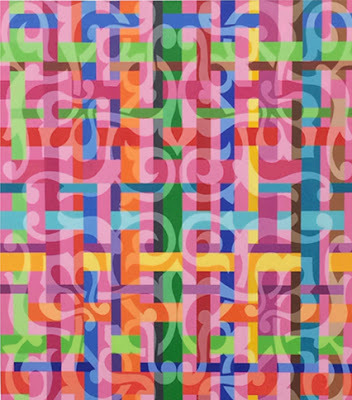 A quick review of the exhibition statement highlighted Cleeland’s journey of vibrant pattern—inspired by a love of global textiles. The statement also referenced the influence of the German born artist and teacher, Josef Albers. 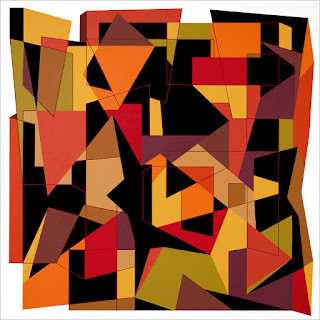 Albers—who had a major influence on American Mid-Century Modern Art—believed that color, rather than form, was the primary medium of pictorial language. After greeting a few friends, I moved in to take a closer look at the work. The Albers reference seemed pertinent. 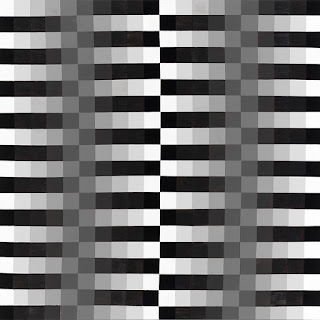 I found that Cleeland’s imagery explores a strange game of perception—playing with spatial relationship and simultaneous contrast. The beauty of the work is the obsessive complexity of the imagery—the layering of organic and geometric forms. The viewer is presented with a series of constantly changing canvases, were the eye shifts back-and-forth from a linier composition to organic… Cleverly intriguing with a scientific twist. Fascism: A political philosophy, movement, or regime that praises nation and often race above the individual… that stands for an autocratic government headed by a dictator, with severe economic and social restrictions, and forcible suppression on all the oppose. Pete Olson: will be delving into the historical context to the phenomenon of Art Against Fascism by discussing the work of Honore Daumier, whose lithographs appeared in Parisian newspapers in the 19th century. He was particularly critical of two rulers with fascistic tendencies, first King Louis-Philippe (who had him jailed) and later Napoleon Bonaparte’s nephew, Napoleon III. The audience will likely find a lot of resonance with contemporary dissent even though the particulars of 19th century French culture may be unfamiliar to them. Fine Artist, Paula Kloczkowski Luberda will discuss corporate fascism as seen through the arts. 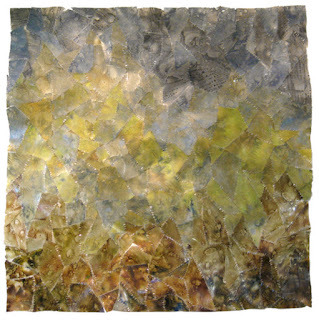 Luberda will present a visual journey that includes some contemporary references as well as her own personal creations. Kimberly Luthen will talk about the artistic response to modern Fascism—listing the behaviors that hallmark Fascist behavior while taking a look at Degenerate art juxtaposed against artistic satire. Cheryl Jefferson, Writer and Executive Producer of “The Art of Influence: Breaking Criminal Traditions” will present on the related topic "From Creation to Impact." Jefferson will define how the arts are key in the fight against fascism. She will discuss what to do once you’ve completed that brilliant painting, sculpture, novel, script, composition or choreography—to assist your work in achieving the goal of reaching the ideal audience for political impact.